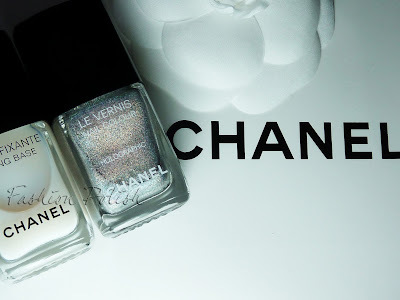 If you had asked me a couple of weeks ago my number 1 lemming, the nail polish I truly believed I'd never possess, I would have answered without a doubt the Chanel Duo Platinum Holographic Set, for obvious reasons : the first being that I had missed it when it was released in 2007 and the second that it's nowhere to be found, unless of course if you're willing to drop $300 on eBay... I mean apart from being the gem of all holos of course! And then one day, my holo dream came true so I had to share all this awesomeness with you! As you can see, the Chanel Duo Platinum Holographic Set includes a fixing basecoat, similar to Gosh or Nfu Oh Aqua Base, a water based basecoat manufactured to prevent patchiness and bald spots. 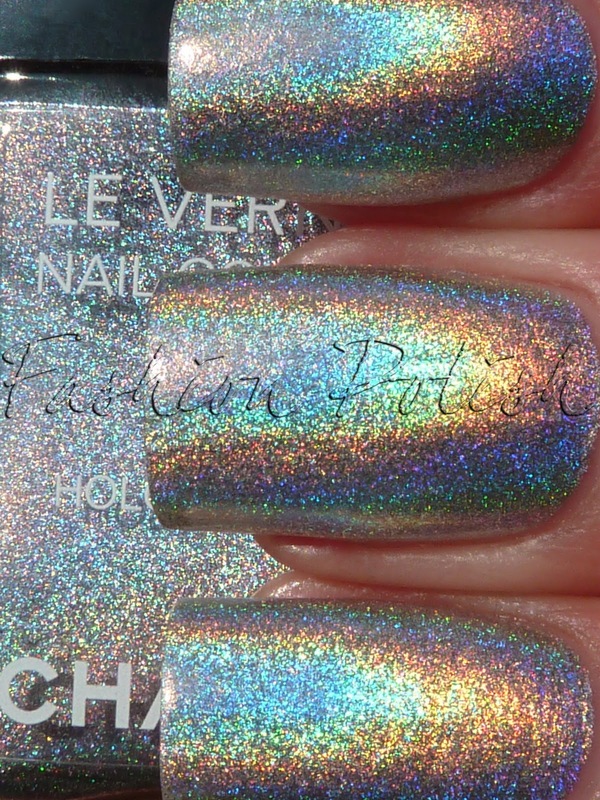 Now, I don't know about you but this is, in my opinion, linear holo perfection! Because I couldn't not compare Chanel Holographic to it's dupes, I decided to do a quick comparison with Gosh Holographic, I didn't feel the need to buy Nfu Oh 61 though. First in terms of application, I found that Chanel Holo was much easier to work with, I tried them both over a regular basecoat and Gosh Holo was way patchier; in terms of finish, they share the same amount of shine but Chanel seems just a tiny bit lighter and smoother but the difference tends to diminish when they dry and the holo effect begins to flash. In conclusion I'll just say that I don't regret one bit buying this set but that you can definitely turn to Gosh Holographic instead (or Nfu Oh 61). However, I've heard that Gosh Holo is being discontinued and that most Nfu Oh 61 are duds now... 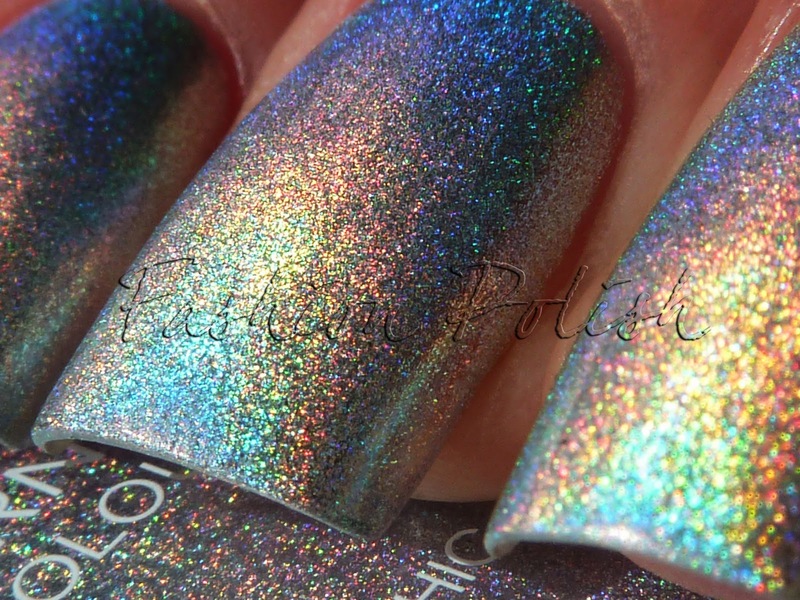 So if you love holos as much as I do , you might want to try and stock up. What is going on with holos lately??? Is there some kind of worldwide holo pigment penury??? Or is it just that holos aren't as profitable to manufacture as regular nail polishes??? 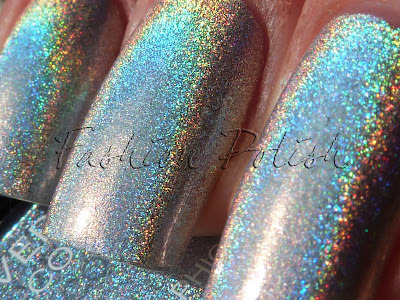 I'd rather give my money to the nail polish companies if they satisfy my holo cravings than to the (eBay) scalpers! I agree, where are all the real halos at!? This polish is crazy prismatic, how did you end up finding it now? omggg that polish amazingggg. soo pretty and shinyyyy! Lovely no other words for it. So how did you end up with this beauty? @Danielle @Rachel Marie I got really lucky, there are no other words... It was listed on the eBay for a very short time (3 days) so I guess it didn't attract much attention and I managed to get it for a "fair" price. 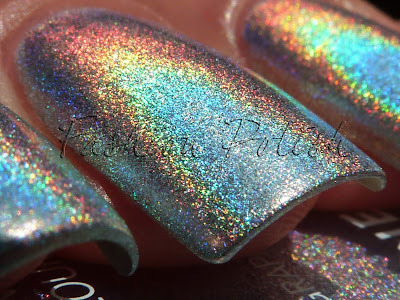 @steph_gem Do you use an aqua base with your Nfu Oh Holos? If not, then you should definitely, it's a life saver... no more patchiness whatsoever, jus a nice smooth, even application! Uh oh, Nfu-oh 61s are duds? I hope that is not the case! That Chanel is gorgeous, though! 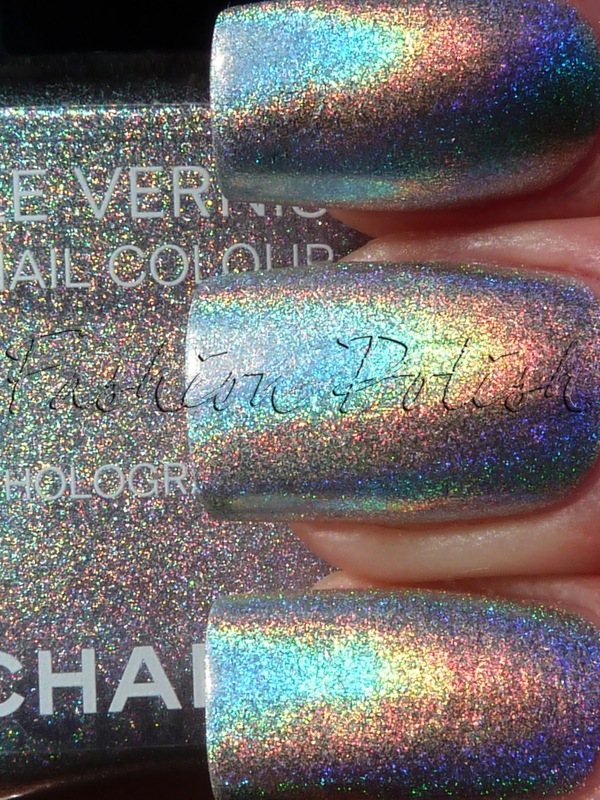 I didn't know chanel did holo!! j avais fait une comparaison il y a un moment ! si tu veux voir ! mais si dans ma région Chanel (le holo) et Gosh sont introuvables, je dois soudoyer qui pour obtenir ces petits bijoux ? tu les as eu comment si c'est pas indiscret ? tu n'as pas le NFU OH 61 pour une autre comparaison ? J'ai eu ma réponse en "lisant" entièrement ton post pour le NFU OH 61. est-il utile que j'aille à la recherche du Holographic de Chanel ou c'est même pas la peine ? allez j'enchaine puisque mes recherches sur le net m'ont fait une blague ? 300 $ sur ebay !!! mais oh mon dieu ! comment vais-je faire ? je vais tenter les boutiques qui vendent du Chanel déjà pour commencer et avec un peu de chance j'aurais le temps économiser pour l'acheter sur ebay d'ici une dizaine d'années ! @Marionne I see you're referring to private conversations now! LMAO. 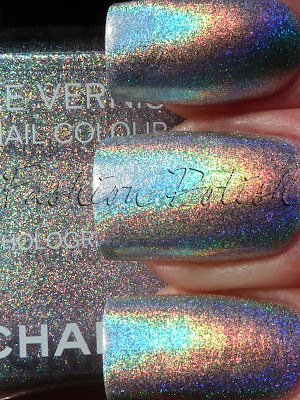 Well, I could wear Chanel Holographic every day all day!!! Having an aqua base, thanks again by the way (and sunny days too) totally changes one's perspective on silver holos. But if you must insist, I'll try an post a nice wearable holo mani very soon. @Iro Tu peux me laisser autant de commentaires que tu veux, j'avoue avoir bien ri en les lisant. Si tu veux te lancer a la recherche de ce vernis, fais le, tu n'as rien a perdre, tu pourrais aussi trouver d'autres perles au passage! / Please, just leave me as many comments as you want, I must say I had a good time reading them! If you want to go an a quest for this nail polish, do it! You might also find a few gems along the way. i could sell my spirit to the devil for getting this nail polish. hum, seriously, it is so gorgeous..
how much did this cost! ?